A collaborative project is out to solve a major public health problem. The project called “ZOOTRIP” is now ready to address the spread of worm diseases that are transmitted from animals to humans due to poor access to clean water, sanitation, and hygiene. ZOOTRIP stands for Zoonotic Transmission of Intestinal Parasites. The said project under the Newton Agham Programme will gather experts from UPLB, UP Manila, and University of Surrey in the United Kingdom. Dr. Vachel Gay V. Paller, ZOOTRIP project leader and associate professor at the Institute of Biological Sciences, estimated that 25% of Filipinos have worm infections. Of this figure, 54% are children. To solve this problem, Dr. Paller said that the project will be focusing on understanding parasitic zoonoses, or the worm diseases that are transmitted between animals and humans. 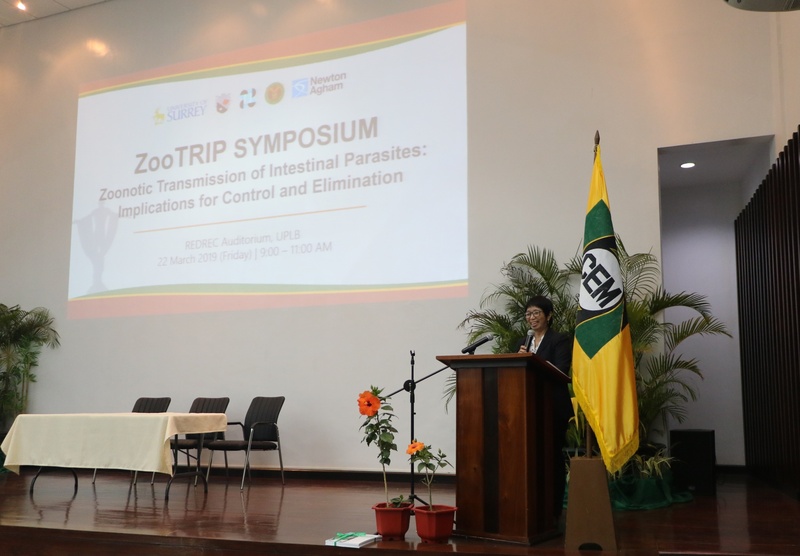 The ZOOTRIP project, Dr. Paller added, will formulate control strategies to decrease the prevalence of identified diseases, such as schistosomiasis and helminthiasis, and to improve health and socio-economic development in poor and marginalized communities. The project will be implemented in schools and households in Sarangani, South Cotabato, Agusan del Sur, and Suriago del Norte, in collaboration with local government units, state universities and colleges, and regional offices of concerned departments. These are the Department of Health (DOH), Department of Education, Department of Science and Technology (DOST), and Department of Agriculture. With such a large scope, Dr. Paller admits that the project will require a lot of effort. ZOOTRIP project will have research on zoonotic transmission at the molecular level to identify resistance markers to develop diagnostic tools and drugs to better understand the diseases. The Memorandum of Agreement for the ZOOTRIP project was signed during a ceremony on Mar. 22 at the REDREC Auditorium, UPLB. It featured Dr. Vicente Y. Belizario, Jr., a professor at the UP Manila College of Public Health and former undersecretary of DOH who is participating as one of the core investigators of the project. Dr. Belizario said that the Philippines has one of the most severe statistics of parasitic worm infections in the world. He identified young children and women of child-bearing age as the most vulnerable groups to parasitic zoonoses, such as soil-transmitted helminthiasis. Infection from parasites, he said, has been found to cause stunting, limited cognitive development, anemia, high infant mortality rate, and susceptibility to other diseases. Dr. Belizario added that farmers, soldiers, and indigenous people are also at high-risk to parasitic zoonoses because of the nature of their occupation and their environment. Aside from having biological science and health components, ZOOTRIP project will also enlist the help of economists and mathematicians in the team to look into the socio-economic and health risks caused by the zoonoses and to formulate control strategies using mathematical models. The project will also implement the One Health approach by surveying human, animal, and environmental health. In his message, Chancellor Fernando C. Sanchez, Jr. recognized the importance of the study to public health, particularly for those in the marginalized sectors. “Finding ways to mitigate these diseases will be crucial in helping improve the living conditions and quality of life of the underprivileged sectors,” he said.